In 2005 I was working for a large IT company near London. When I decided to strike out on my own as a web designer I told my colleagues and they were naturally very happy for me. I also told them I would be returning to my home town of Nottingham. Many of them asked me why iwas doing so. I responded that as I would not be earning much whilst I built up the business, the far lower cost of living would be beneficial to me and also that I would have a better quality of life. Most of them laughed at this second point. "A better quality of life?" most would scoff. But yes that's right. You see I think Nottingham has the balance just about right and is one of the best places to live in the UK and also one of the best places to do business. Nottingham is within a region known as the East Midlands. It's right in the heart of the country, London is only an hour and a half away by train and we are also not far from the North's power house of great trading cities from Manchester right across to Leeds. We're in such a great position. But that's not the only reason. The cost of living in the East Midlands is far lower than London and the South East. You can buy and rent property for a fraction of the price it would cost you just 100 miles further south. This means that a far greater percentage of your income can be spent on other essentials and pleasures of life. This means our economy has much more freedom and isn't purely based on diverting vast sums to landlords and land-owners. The money you save by being here allows you to set up a new business with such ease. There are very few businesses that bring income immediately, so paying lower rent or mortgage costs are of great help when trying to get your business off the ground. A local university recently published a list of the 20 largest businesses in the Nottinghamshire area. The business that was number 200 in the list has a turnover of £23 million per annum. So the number of multi-million pound companies in such a relatively small location is enormous. Add to this the thousands of small businesses helping keep our economy buoyant you can see why Nottinghamshire is such a success story. Nottingham is home to two very large universities meaning there is a great deal of talent to draw upon should you need the right staff to help your business succeed. They are also a great influence on the creative side of business in Nottingham meaning that you will be working in an atmosphere of creativity, talent and success. This article sounds like shameless promotion of Nottingham and I suppose it is. I have a vested interest in doing so. The more businesses there are the more customers that will require a professional website! 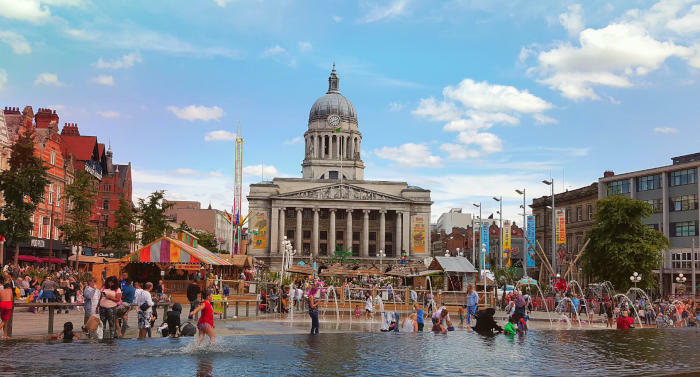 But I really believe I am in the centre of something special here and if you are looking for somewhere to transfer or start your business then Nottingham might just be the city for which what you are looking.